I swore to myself I’d get my manuscript done in 2017. It didn’t happen. I could talk for hours about all the legitimate reasons it didn’t happen. I could talk for even longer about all the ways I procrastinated and avoided it. Does it make logical sense why I chose to avoid something I care about so much? Yes and no. It would take thousands of words and hundreds of dollars in therapist fees to explain it. Focusing on 2018, I was determined. It helped that I landed a full-time job that starts at the end of February. It also helped that based on some personal circumstances, I realized the manuscript needed to be finished. It was now or never. My manuscript is a memoir. It’s based on my journey through the fertility process. It details a year and a half of my mid-30’s, where the life I’d imagined for myself faded to black. I had been pregnant with twins. But five days after I became pregnant, I lost my mother to cancer after a lifetime of addiction. The following week, I lost the twins. And nine months later, as I twisted the sterile bed sheets in my hands, I listened to my doctor tell me I would never be able to have children. It’s a survival story about losing a past and a future at that same time—and learning to carve out a present much different than the one I expected for myself. Those were dark days. The harder I held on to the life I thought I should be leading, the more painful everything else was. But as soon as I pushed off from the ledge, trusting that whatever I fell into was going to be okay, I was free. After such loss, it’s hard not to build up callouses of control again. They start innocently enough with the little things. A set of activities, a diet to follow, a daily routine. But as time passes, it becomes less of a routine and more of a schedule. The control creeps in a bit more, and it morphs your discipline into fear. It’s easier to write around things. You can write extraordinarily detailed outlines with plot points and character arcs and detailed scenery. You can research and read for hours about how other writers have worked through their pieces, look at maps on structure and complete case studies of manuscripts that you love. You can build the most beautiful scaffolding to support the building of your dream word house. All of this to try and control your fear of sitting down in front of a project with zero words written. But at one point, you need rip down the scaffolding. You need to hang by your fingertips, in all the discomfort, in all of the pain, in all of the not knowing and write just what you see right in front of your face. You need to let go. In college, I was a straight A student who once took a class “pass/fail” to give myself a break. Turns out I didn’t know how to relax my effort and ended up getting an A anyway—though that only showed up as “pass” and I suffered in the process. 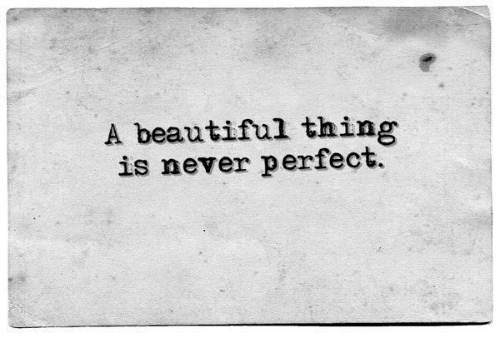 At the time, though, I thought perfection was an admirable goal. I patted myself on the back for it. Then I lived more of my life and learned something valuable. Although still conditioned to strive for perfection, I’ve come to appreciate the haphazard, the imperfect, and the uncontrollable. I see that at the untidy edges of life, passion escapes its shackles and truth is revealed. Messy, incomplete, and broken are beautiful, too. The other day, I was cleaning my office, trying to create order once again. The recycling bin had overflowed, and the piles, stacked everywhere—comprised of random bills, things to remember, upcoming events, and business notes—no longer made sense. I sighed, thinking it was a disaster. However, as I sorted the papers into keep and throw away piles, I came across all kinds of random thoughts jotted down and forgotten. My writings were on scraps of paper, half-written spiral notebooks, and yellow note pads, interspersed among “to do” lists, travel itineraries, and business documents. These random introspective thoughts perfectly reflected my experience of late—haphazard, messy, and unfocused, but unexpectedly poignant. It was as if, in the periphery of my hectic life, there was a part of me reading between the lines, noticing the beauty, enlivened by life and appreciating it. “Out of the corner of my eye, I see the truth . . . that life is good, that existence itself is a miracle. I sense the glory often—but too often I see life face on. I see the content of life. I see suffering. And suffering comes from the weaving of sad stories—stories that weave webs of fear and loneliness. Just today a friend of mine was struggling, unable to see anything but a broken arm and a broken car. She said she’d been up all night, stuck in the loneliness of the wee hours in a blackness that felt bleak, not deep. I know that place too. I want to enfold her in my arms—to tell her everything is okay; nothing is wrong. That life is a rich tapestry and that she is an integral part of that. Soften your gaze I want to say. This too shall pass. And, while I may not have arms big enough to enfold all of suffering, Life does. Just out of the corner of my eye, I can see the truth, can you? My life—all of it: spiritual worldview, material worldview, being happy, being stuck—is my practice. There is no part of my life that is not an opportunity. Of course, I have known this intellectually, but it hit me viscerally this morning on my walk. Life itself, I reflect, now—like my office, like my random thoughts, like the tree growing crookedly between other trees—is Wabi Sabi perfect, just as it is. As a writer, this understanding has freed me. I’ve gently let go of the student constantly striving for an ‘A’ in a pass/fail setting—the perfectionist holding my writing hostage. I now throw all kinds of ideas down on bits and scraps of paper. I capture random moments and insights. Some I use, others I don’t. Sometimes, wildly disparate ideas from different times and places and different scraps of paper find themselves together in an article. Truthfully, I am never sure where the inspiration comes from, but I appreciate that it is the messy edges of life that pulse with vitality—and that is what I want to write about. I am a Wabi Sabi writer writing about Wabi Sabi life.